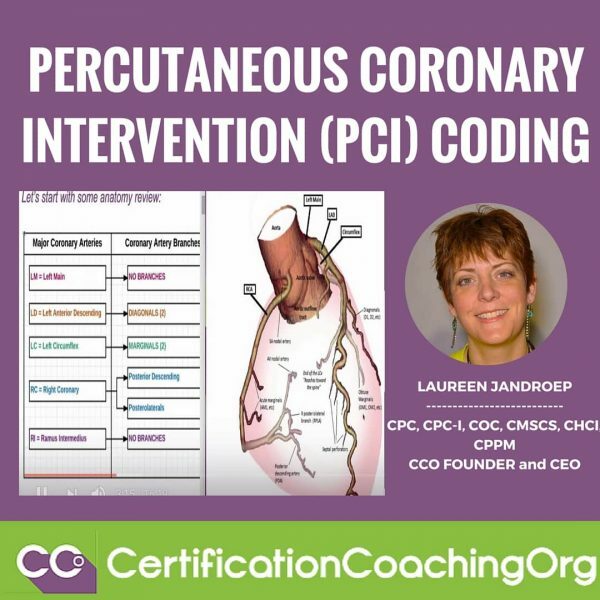 Q: Please review PCI (Percutaneous Coronary Intervention) CPT Coding. A: These codes went through a change in 2013 and it’s a big change. You get used to how something work and you teach it year after year and it took me a while to present it in a way, and I hope I’ve gotten it tonight to help make it clear. I want to start do some anatomy review. Basically, we’re dealing with the coronary vessels and a fix is being done to them, whether it’s a stent to bridge open the vessel or it’s a balloon angioplasty to squeeze the plaque to the side or an atherectomy to scrape it. We need to know what vessel CPT is recognizing for coding purposes. These are the major coronary arteries that I have here on the left. We’ve got the left main. By the way, these abbreviations are also HCPCS modifiers, not all payers recognize them. Sometimes they’ll kick them back and say that it’s an erroneous modifier when it’s not, so be aware, only use them if the payer wants them; otherwise, you’re going to have to resubmit your claim. But it’s really handy for teaching to be able to just use these initials. LM = Left Main coronary artery. LD = Left anterior descending. LC = Left Circumflex. RC = Right Coronary, and RI = Ramus Intermedius. Those are the five recognized coronary vessels by CPT. Of course there’s more but these are the ones that coding-wise are recognized. 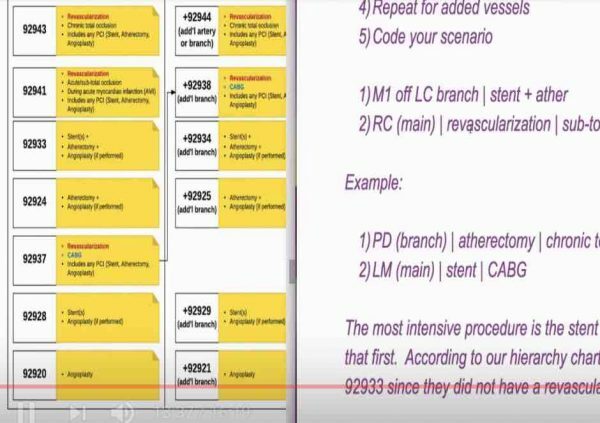 With these PCI codes, they also recognize coronary artery branches. It’s important to know what it branches off of as I’ll show in a minute why. The first one, the left main and the last one, the Ramus Intermedius, they don’t have branches, so we don’t have to worry about them. The middle three, the LD, has two branches that are recognized they’re called diagonals. Sometimes you’ll see them abbreviated as D1, D2. The Left Circumflex has two marginals that are recognized. The Right Coronary has a posterior descending and the posterolaterals that are recognized. Screen split, I just wanted to show you a picture of some heart anatomy. Here’s the Left Main we just talked about and here it is on the picture. Sure enough, there are no branches coming off of it, so that should help you there. The LD is right here and we can see that coming off the LD we’ve got the diagonals; even in this illustration it’s abbreviating it D1 and D2. The LC is kind of faded in this picture in the background because it’s behind where the Left Main and LAD is, and off of it you can see the Obtuse Marginals; so they’re abbreviated OM1 and OM2. Those are two that are recognized for CPT purposes. The Right Coronary is over here and off of it you can see here are the posterior descending and the posterolaterals. These therapeutic procedures can be done in any of these main arteries or their branches. So, keep that in mind now that we have the anatomy down pat. I wanted to talk about what are some of these procedures? An angioplasty, also known as the PTCA for percutaneous transluminal – that’s through that tube – coronary angioplasty. It’s basically think of the balloon squeezing the plaque. It’s one of the least intensive of all the procedures, therefore, it tends to be bundled into everything else. The only time you would code it is if that’s all that was done to the vessel, and here’s an illustration of it. You can see the catheter with the deflated balloon being put in the middle of the vessel and there’s the plaque and then they inflate the balloon, squeezes the plaque to the side of the wall. Here’s a little cross section here. The next higher up in intensity level of procedure is atherectomy and that’s basically somehow getting the plaque off the lining of the vessel. There are different methods that can be done. They all will use the same code, so you can have a directional atherectomy or you can have a rotational (spins and breaks it up in little pieces), or you could have a transluminal extraction (like a hook that goes down like a crochet hook and pulls it back), and then you can have laser. Those are the different kinds of atherectomy procedures. Stents – a stent looks very similar to a balloon angioplasty but around that catheter is like a cage, a synthetic cage and it collapse and then they expand it and it helps bridge open the vessel; so now you could have that plaque squeezed to the side as well as it holding open the vessel. Very similar-looking to the PTCA, but that is higher in intensity, therefore it normally bundles in the angioplasty. Now that we have the anatomy and now we understand the procedures, how do we code it, how would you bring it together to code it? I’ve got some coding steps here. 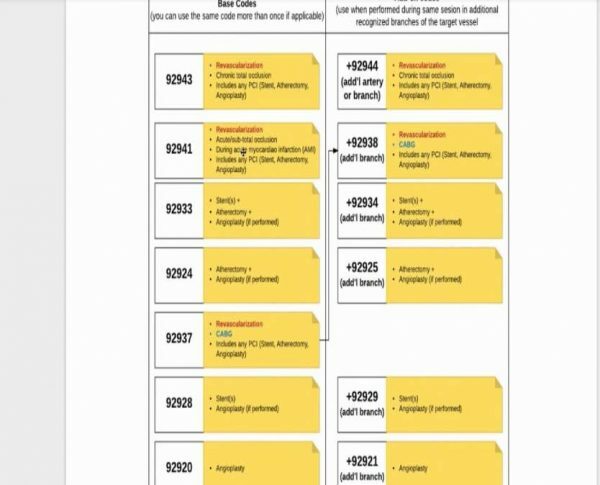 Again, if you’re a Replay Club member, you will get access to all these answer sheets, so sit back and relax and just try and take in the information. 1. 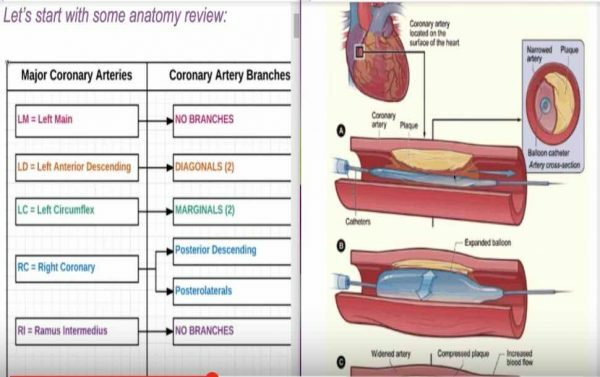 Determine all the arteries and branches that were worked on. I recommend have a worksheet, list them out; what did you do? It might be the left main had an atherectomy, the right coronary had a stent and an atherectomy. If you can list out what was done to each vessel, each branch, that will make it much easier for you visually to be able to code it. 2. For each recognized artery or branch (this is the list here that we just looked) list all the procedures/interventions done. Now, we want to figure out which one had the highest intensity level service done because we want to code them in order of highest level of intensity to lowest. This chart here is taken right from the guidelines. The guidelines tell you for the base codes, this is the hierarchy order. 92943 is the most intense procedure. If you did a revascularization chronic total occlusion, that’s the highest level procedure you could do. The next in the hierarchy is 92941, that’s also revascularization but it’s for an acute/sub-total occlusion. This one, very key, it’s during an acute MI, so this is an emergent procedure that they go in and do; there’s a heart attack going on. That’s this code. These include any of those procedures we just talked about – angioplasty, atherectomy or the stenting. You could do one, you could all 3, you don’t code them combo code is what this is. 92933 – Is the next step-down. This is when you’re doing stent(s) with an atherectomy and angioplasty if performed. Notice the stents are in plural. Sometimes they do two stents in the same vessel, you still only report one unit of 92933 because it’s stent or stents. 92924 – Going down; this is an atherectomy, there is no stent. If they also did the balloon angioplasty, the PTCA, that’s bundled in. It has to do both; if performed. 92937 – This is another revascularization. I did all the revascularizations in red. This one is of a coronary artery bypass graft. That’s key; if you’re not working, if the documentation isn’t showing that they were working on a graft, then this is not the code selection for you. It also includes any PCI. 92928 – This is a stent with angioplasty or just the stent. 92920 – Angioplasty; that’s the balloon angioplasty I showed the picture of. These are for the base codes. You want to figure out if you had the Right Main, had one of these, had a stent; then you had to figure out was it stent with an atherectomy, or was it just the stent, or maybe with an angioplasty? That will tell you is it a 933 or 928. Did they also have a revascularization done? Well then that’s going to be 92937 unless they also had a heart attack going on; so you got to figure out all those variables and code the highest one. On the right hand side of this picture, these are for the add-on codes. For the most part, add-on codes are used when you have an additional branch being worked on. The base codes can be used for main arteries and branches, but when it’s an additional branch, then you’re going to use this add-on code. The only exception is this first one, 92944, it’s for additional artery or branch, everything else is for an additional branch. This is the hierarchy that they give you in CPT. For the most part, they match side by side with what we saw for the base codes. The one exception here is 92938 is considered the second highest in intensity, the revascularization, which is an add-on code to this one here. Don’t think they always go hand in hand like that. The next one down is the 92934, that’s the stent(s) with the atherectomy. The next one down 92925 is just the atherectomy with possibly an angioplasty. Then we’re back to the stents only or with an angioplasty (92929), and finally just an angioplasty (92921). So you have this pecking order figured out, now you need to take a scenario and try and put it together. 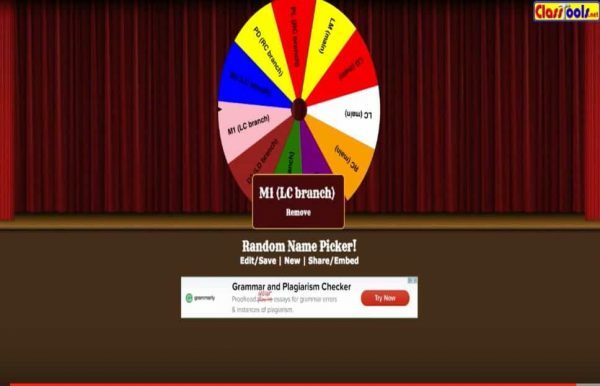 Scenario Builder – I had made this little game that I want to try with you guys. Basically, I’ll show you real quick just so you could practice with yourself on all the different scenarios, I put in all of the vessels; so we’re going to click to spin, let’s see if we can code it. My kids were very excited when I was doing this, they came running in the room. They’re like, “What is that?” I said, “Homework” then they ran away. This is telling me the Marginal, one of the marginals off the LC branch, let me write that down. That’s our vessel. Now, let’s figure out a procedure that’s done to that vessel. Who wants to give me a procedure? Let’s do stent with atherectomy. Let’s also do another vessel, let’s do the RC, which is the main vessel, and let’s do a revascularization and they have a sub-total occlusion. Now we got this, using our little chart, which code is going to have the higher level of intensity? Is it going to be the stent with the atherectomy or the revascularization? We should have done a poll. Yeah, it is the revascularization, and we have two revascularization codes. We’ve got one that’s chronic total occlusion and one that’s sub-total. I said it was sub-total, so our code is going to be 92941 for that most intense procedure. Now, we want to code this Marginal branch that’s off of the LC. That could be done, probably not always, so how would we code that one with the stent and an atherectomy? The first question we had to figure out, should we be in the base code column, or should we be in the additional branch column? What do you say, base or add-on codes? Put in the chat. Base. Very good, Lisa. Yes, it would be a base code because it’s not an additional branch off of the RC main; so it would get its own base code. This one stent plus atherectomy, here it is, that’s going to be the 92933. OK? If we changed this to be the same scenario, but now we’re going to make it off the RC branch. That’s branch off the RC vessel, I meant. So, now, this is an add-on code. How would we code a stent and atherectomy, that’s an add-on code, that’s going to be this code here, 92934. So, 92941 + 92934, just an add-on code. OK? Hopefully that helped you with understanding the PCI codes better. I had fun doing it, and there’re some more examples, if you’re a Replay Club member to keep testing that out. But this chart should help a lot and I think we’re going to probably be making that available on the site as a freebie because I know this is a real tricky area. 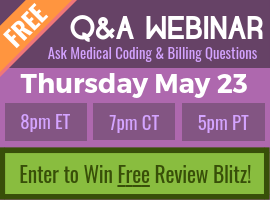 Hello Where can I get clear copies of the charts due in the webinar for the PCI CPT Coding? Thoughtful discussion ! I loved the facts – Does anyone know if I could possibly acquire a blank TSP-76 form to edit ?